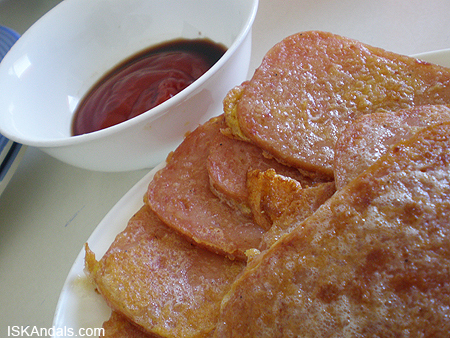 La.Pi.S11: How Do You Cook Your Luncheon Meat? 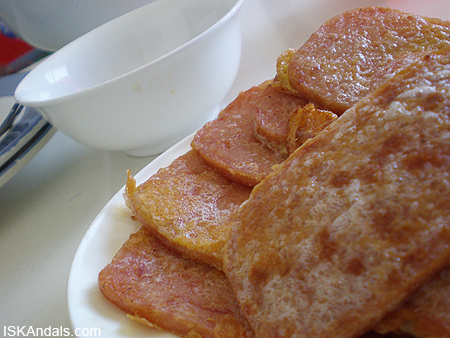 Nevertheless, whether it is Spam or Purefoods or Swifts, here is a good way to enjoy your luncheon meat. Great for Sunday breakfast when you’re just too lazy to thaw anything from the freezer but don’t wanna have the usual toast for such an important family day. O para maiba lang… variety ika nga. Break an egg in a shallow plate, sprinkle salt and pepper. Beat with a fork until well blended and no streaks of egg white. 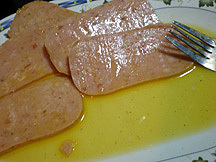 Depending on the shape of your luncheon meat, cut it to have equal size and shape. Slice thinly. Dip them one by one into the egg mixture until well-coated. Deep-fry until crispy. Serve with fried rice. I dip ‘em into a mixture of ketchup and soy sauce. YUM! Para sa Lasang Pinoy, Sundays. Breakfast. that’s something new for me … i should definitely try that! Yeah, I cook it this way too! Lately na lang I use them for musubi so no more eggs just fried and placed on top of sushi rice or roll into nori! yum! Ooh, sarap! Miss ko na rin ang Maling. Makabili nga mamaya. My daughter and I were just saying how we were craving some spam. My husband can’t understand how we can eat that stuff. lol! gamefanatica, hmmm… that sounds interesting. Mukhang OK yan. I remember my college days, nagsasawsaw kami ng hamon sa bagoong! Yummy, really! we just fry it until it gets toasted (especially the edges)! u8mypinkcookies, good on you! Sarap diba?